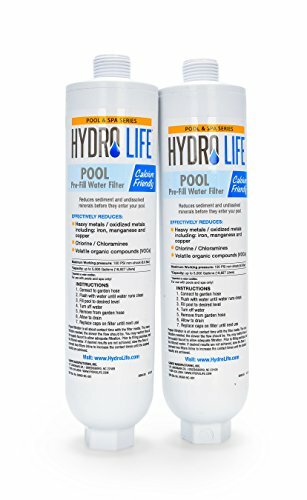 Hydrolife Pool Pre fill Water filter is designed to be used on your water source as you fill or top-off your pool. The filter media effectively reduces levels of heavy metals, chlorine, chloramines and volatile organic compounds, which helps make balancing chemicals easier. It also pre-filters stain causing metals like iron, copper and manganese before they have a chance to damage your spa. This easy-to-use filter connects to any standard garden hose and filters up to 5,000 gallons of water per filter, depending on the quality of the water. Comes in a convenient 2 pack for a total capacity of 10,000 gallons. If you have any questions about this product by Hydro Life, contact us by completing and submitting the form below. If you are looking for a specif part number, please include it with your message.